Vivian Lawry has been sailing on the Chesapeake Bay since 1995, her coauthor even longer. It was on one of their earlier trips together, anchored in a favorite gunkhole on Swan Creek, that the plot for Dark Harbor was conceived. Read more about Vivian Lawry on other pages of this website. Listen to Vivian’s radio interview with Neal Steele on XTRA 99.1 FM, broadcasting out of Gloucester, Va. (Jan. 11, 2010). 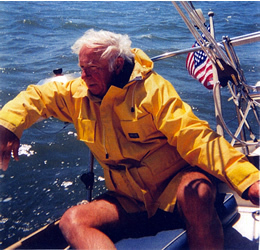 W. Lawrence Gulick has been sailing since he was nine, and has skippered boats from the waters of New England to the British Virgin Islands. A merchant mariner and a paratrooper during WWII, he subsequently earned a doctorate in neuroscience from Princeton. He’s been both a professor and a university president. When he isn’t sailing, he enjoys composing at the piano and woodworking. Visit his website at darkharbormystery.com.